To help our clients understand their buyers, SiriusDecisions conducts significant and objective primary research. One of the most interesting discoveries revealed via our most recent b-to-b buying study is that there is not one buyer’s journey. In fact, there are three common, distinct scenarios of buying behavior that we isolated. It’s important to know which buying scenario that an offering or campaign is associated with in order to align go-to-market strategies to how b-to-b buyers buy. This is a highly complex purchasing process; the buying decision is phased, structured and hierarchical. This scenario is typically associated with large buying entities, most commonly organizations with $1B or more in annual revenue, and representative of offering types with price ranges in the hundreds of thousands to more than $1 million. The length of the buying cycle clusters around six months; however, we observed many instances of the purchasing decision lasting longer – as much as a year or more to make a decision to buy (licensed members can read the brief “The SiriusDecisions Buying Decision Process Framework”). In a committee scenario, our study showed that six to 10 individuals were involved in the decision to purchase across multiple departments or functions (buying centers). The committee buying scenario requires the highest level of interaction between the buying entity and the provider organization to facilitate a decision to purchase an offering (licensed members can read the brief “The SiriusDecisions Buying Interaction Model”). We observed, on average, approximately 18 interactions (nine non-human intereactions and nine human-to-human interactions) occurring in this type of scenario. Consensus was the most common buying scenario that SiriusDecisions observed across all organizational size dimensions. Consensus is a team-based buying scenario where multiple people are involved across the organization. The typical price range for an offering in this scenario was $50-500MM USD (with longer tails for billion-plus for organizations with more than $500MM in revenue, and longer tails for under $50MM for emerging organizations [under $50MM in revenue]). In this buying scenario, the decision is horizontal and canvasses multiple departments or functions. It is not as complex as the committee buying decision because does not go to a senior level executive team, but it is still moderately complex as consensual decisionmaking is much harder to facilitate, given there are so many dynamics given the involvement of multiple buyer personas that must be influenced and informed in order to attain the vote to purchase the offering. We observed, on average, approximately 14 (seven non-human interactions and seven human-to-human interactions) occurring in this type of scenario. This is a simple buying scenario where one or just a couple of people were involved in the decision to purchase, and the decision was easier to facilitate than committee or consensus decisions. The decision to purchase is made by one or two buyer personas and does not go either horizontal (consensus) or vertical (committee); the decision remains in a specific function or department. Thus, because the purchase is independent of the consensual voting or formal committee approval-type dynamics and there is no need to gain consensus represented by the other buying scenarios, the decision can be made independently or in isolation. It’s important to not confuse this scenario with transactional or e-commerce purchases. While the independent scenario is most related to those types of purchasing methods, our research has identified offerings purchased over the Internet in the other buying scenarios as well. This buying scenario is the least complex, as there is less impact from internal influencers and the provider only has to inform and persuade one or two key buyer personas. This makes it much easier to devise messaging, content and campaigns. The independent buying scenario requires the least amount of interaction between the buying entity and the provider organization to facilitate a decision to purchase an offering. We observed, on average, approximately 12 interactions (six non-human interactions and six human-to-human interactions) occurring in this type of scenario. The 2015 SiriusDecisions B-to-B Buying Study reports observations from studying the recent b-to-b buying decisions of over 1,300 b-to-b executives across North America and Europe. For more information on the reports (available to members of the SiriusDecisions portfolio marketing research and advisory service), download the brochure. For members of the portfolio marketing service, click here to read the full research brief with deeper data and insights. Marisa Kopec is Vice President and Group Director, Go-to-Market, at SiriusDecisions. She leads SiriusDecisions’ Portfolio Marketing, Strategic Communications, and Product Management services. Follow Marisa on Twitter @Marisa_Kopec. Marketing has changed more in the last five to seven years than at any other time during my career. The pace of change has quickened, there is more direct pressure for marketing to demonstrate its contribution to the bottom line, many more channels of communication are available to reach increasingly fragmented audiences, and all of this must be done with scarce and expensive talent and resources. Despite all this change, many of the core processes of marketing remain unchanged. We still spend time writing thick marketing plans, constructing yearly budgets, launching big-bang ad campaigns and targeting broad audiences (instead of having conversations with people). Some marketers, including myself, are taking a different approach—one based on agile development. Software developers faced a similar crisis in 2001. They were pressured to get more done with scarce resources, and to adapt rapidly to change. They responded with a set of principles and a methodology called agile development, and it has transformed software programming. I believe that we can apply many of the same principles and methods to marketing and transform our discipline. Agile marketing is an iterative and experimental approach to marketing that values adaptability and responsiveness to change over long-term planning. It also values individuals and two-way marketing interactions, as well as collaboration among the various marketing disciplines. There are six core values of agile marketing. Responding to change over following a plan. It’s not that agile marketers don’t do any planning; they do. However, they put a premium on adapting and responding to the marketplace through constant adjustments to their plans and priorities on a weekly or biweekly basis—rather than an annual or semiannual planning cycle. Rapid iterations over big-bang campaigns. Few marketing campaigns can get it exactly right the first time, and there is also value in speed to market. Agile marketing recognizes this and values an iterative approach. It encourages marketers to try something out quickly and fine-tune it as they go, rather than putting all of their energies and dollars behind a big-bang campaign. Testing and data over opinions. If you’re iterating, how do you know something is working or not working? Data makes the difference. this is an example of individuals and interactions. Collaboration over silos and hierarchy. In this era of specialization, it is tempting to organize marketing departments around skill sets: PR, advertising, social media, etc. But to the buyer, the product or the company is the product or the company, regardless of the medium used for communication. Collaboration is necessary to ensure not only consistency of message, but also a user experience that is consistent and pleasing. Teams that collaborate also get more done. Agile marketing is a mindset: Marketers who practice agile marketing put the customer experience at the center of everything they do. They focus on solving buyer problems and the buyer’s journey, not on selling and the sales cycle. Lastly, agile marketing is about aligning marketing with the business and sales goals of the organization, getting stuff done quickly and documenting the results with transparency and accountability. How do you “plan for change”? How do you organize your marketing team to respond to new demands when you don’t know what those demands might be, or how you’ll address them? The first step is to admit that your priorities will be in a state of constant change and to throw out those tools that give a false sense of security about the amount of control you have over that change. Throw out yearly marketing plans, yearly marketing budgets and rigid organizational charts. Instead, revise your priorities, including how you spend both your time and your budget, on a regular, frequent schedule: at least once per month, and if you’re really ambitious, once every two weeks. Second, make it someone’s job to rapidly respond to changes and opportunities in the market. Depending on the size of your organization, create a team, assign a person or make it 50 percent of someone’s job to respond in real time (somewhere less than 24 hours, perhaps less than 4 hours) to particular kinds of opportunities such as competitive threats, newsjacking and brand-damaging events. Scrum is a formal methodology that can help you revise your priorities. Agile marketers use it to manage their work, just as agile development teams use scrum to manage software development. It’s beyond the scope of this article to cover everything you need to know about scrum, and many of the readers of Pragmatic Marketer are very familiar with both agile and scrum. Instead, let me outline the basics of scrum, and discuss how scrum for marketing is somewhat different than scrum for software development. Scrum starts with the marketing backlog, which is basically the list of all the potential activities that marketing could do. The marketing backlog can be seen as the “wish list,” although it should be cleaned up and prioritized over time. Unlike scrum for agile software development, most marketers do not write user stories. Instead, they break tasks down into manageable chunks that are typically half a day to 1 week in size, describing what’s to be done, who the audience is, what the desired outcome is and how success will be measured. At the sprint planning session, the marketing team meets with executive management and sales for 30-60 minutes to hear about the current business and sales priorities, adding any new items that come up into the marketing backlog. The team then prioritizes work off the marketing backlog, accepting enough work to fill the length of the sprint (usually 2-4 weeks of work). 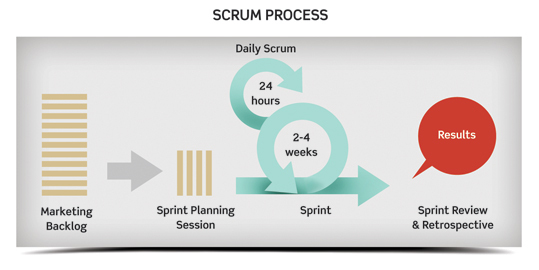 Although scrum as practiced by developers requires assigning each item story points (a measure of the complexity of the task), I find that marketing teams tend to keep it simple, deciding for each task whether it is a half-day, full-day, half-week or full-week task. Anything that is bigger or longer than a week’s worth of work should be broken down into smaller tasks. Once the team has 2-4 weeks’ worth of prioritized activities, they go to work. This 2-4 week period of getting things done is known as the sprint. What work did I complete yesterday? What issues, if any, are blocking me and preventing me from moving forward? The sprint retrospective is a short internal meeting of the marketing team to talk about what worked and what didn’t work during the last sprint. It allows for adjustments to the process and methodologies used by the team over time. Who Is Practicing Agile Marketing? Agile processes and tools are actually install mechanisms for culture. By requesting people to work together in certain ways, track specific metrics and check in with each other at specified intervals, companies can put in place the building blocks for people to interact in positive, productive ways. EMC is also an early adopter of agile marketing. You can read about their success with agile marketing at Scott Brinker’s Chief Marketing Technologist blog, www.chiefmartec.com as well as watch a video of David Quinn, EMC’s senior director of corporate marketing, presenting to the Agile Marketing Meetup group in Boston on YouTube. Quinn credits agile marketing with changing how EMC launches new products and interacts with the business groups. It not only has helped the marketing team with time management (and eliminated those long “coordination” meetings), but also provided greater accountability and transparency. Lastly, I should mention Frank Days, whose blog Tangyslice.com has been a source of inspiration for me. He has implemented agile marketing at Novell and Correlsense, and his approach to agile marketing is refreshingly pragmatic. He likes agile marketing because it helps him get better results, plain and simple. For the past five years, CEB has been studying the evolving roles of sales and marketing professionals, in the context of the changing B2B customer. In 2011, our book “The Challenger Sale” turned the idea of the high-performing sales rep on its head. Well, I’m thrilled to announce the release of our new book, “The Challenger Customer” – available Sept. 8, 2015. Along with my fellow CEB authors, Brent Adamson, Matt Dixon and Nick Toman, we’re genuinely excited to release this next chapter in the Challenger journey. In many ways, this book picks up the story from “The Challenger Sale,” but with significantly more research on the relationship between Marketing and Sales, and with extra focus on B2B buyers. The punchline: If marketing and selling solutions is hard, buying them is even harder! Consensus purchase dynamics are stalling deals, often before they even get to a stage where customers engage with your content, much less one of your sales reps. The number and diversity of stakeholders involved in purchases is increasing, and those parties are failing to arrive at the kind of consensus early on in the purchase to give suppliers any chance of winning high-quality deals. The implications for Sales and Marketing are huge and we unpack all of this in the book. The upshot is, Challenger isn’t a sales methodology, it’s acommercial strategy. It affects what Marketing and Sales need to do individually and together. With all of this in mind, I’d like to share some of our thinking on how Marketing organizations should change under a Challenger strategy. Just as sales reps need to change their behaviors to challenge customers, front line marketers need to change their approach as well. Leading up to the launch of the book, we’re releasing a series of Challenger Marketing role guides for Product Marketers, Field Marketers, Demand Generation Managers and Channel Marketing Managers. So, I’d like to take the time to walk you through the first of the series, focused on Product Marketers, check out the role guide for additional details. What Should Product Marketers Do Differently Under a Challenger Model? And in response, product marketers feverishly set about making that value prop even more crisp than it already was. However, based on all of our research, we believe product marketers are overly fixated on crafting and sharpening the value propositions for the products they market. That sounds like crazy talk, doesn’t it? So, what do you do now? No amount of tweaking or clarifying the value prop will solve that problem. The customer already gets that your solutions provide incremental performance. Based on our research, we believe the number one thing a product marketer needs to do differently under Challenger is to cut the time spent sharpening value props by 50 percent, and instead shift that energy to developing Commercial Insights. A Commercial Insight teaches the customer something new that reframes how they think about their own business, and leads uniquely back to you as a supplier. When crafted well, Commercial Insights lead customers to value—and pay for—the incremental performance you provide. It gives customers asurprising rationale, in their own business terms, to value that incremental performance. That’s why Commercial Insights are at the heart of the Challenger approach. Product marketers—with their knowledge of the marketplace, product vantage point and relationships across the marketing and sales organization—are in the best position to orchestrate Commercial Insight creation. And it really is orchestration—it takes a mix of characters from Product, Sales, Marketing and potentially other parts of the organization to create Commercial Insight. But if product marketers don’t take the lead here, no one else will. At least, not as effectively as a product marketer could. You’ll find a brief example of a Commercial Insight from Xerox XRX +0.73% in theChallenger Role Guide for Product Marketers. And in “The Challenger Customer,” we’ll lay out a methodology for creating Commercial Insight, with plenty of practical guidance and frameworks to get you going. You can find more details on the other areas where product marketers need to do things very differently in the role guide. Hint: They need to think about customer understanding and content creation very differently, as well. Patrick Spenner is a Strategic Initiatives Leader in CEB’s Marketing practice, variously spending his time on research, new product development and thought leadership. Since joining CEB in 2005, Patrick has overseen membership programs serving the needs of CMOs, Corporate Communications executives and Marketing Communications executives. Prior to working at CEB, Patrick led a business line in Capital One’s marketing and analysis group. In that role, he managed all aspects of the marketing mix for the business, including marketing communications, pricing, segmentation, sales strategy and distribution, and analytics. In the distant past, Patrick worked in business research on initiatives supporting heads of strategy and human resources at Global 1000 corporations. Patrick holds a Bachelor’s Degree in Economics from Georgetown University and a Master of Business Administration degree from Stanford University. (Q) The Product Marketer: First & foremost, we’re interested to hear your perspective on what role a Product Marketer plays in a B2B organization today? (A) Maybe it’s because I work more with startups than larger companies, but I am seeing a blurring of lines across Marketing, Sales, and Product. I feel like we are moving away from an organization where teams are very siloed toward one that is more agile and fluid with respect to functions and processes. Things that were traditionally “sales only” or “product only” are now often looking like things that marketing can and should tackle. In a world where this is happening, Product Marketers have the unique opportunity to help bridge that gap. I see Product Marketers (or at least a product marketing skill set, even if the title doesn’t match) as being something that is in increasing demand. (Q) The Product Marketer & Positioning: The godfather’s of positioning, Ries & Trout, posited that “positioning cuts through the chaos.” In the world of B2B, what’s your definition of positioning? What is it NOT? (A) Positioning is about providing a frame of reference for potential customers to understand what you do and why they should care. It’s not a tagline or a slogan and it definitely isn’t branding. Positioning is the context that makes sense of what your offering is, what the primary value is and who that offering is really for. Positioning is the foundation for not just marketing but sales strategy, product strategy and even support and hiring. (Q) To ensure that Product Marketers are viewed as true Architects of Growth by the C-suite, how should Product Marketer’s position for advantage? (A) In my mind the fundamental value that Product Marketers bring to the table is a deep understanding of customers, including what customers hate, what they struggle with and what they really love. Marketing tactics change every week and frankly, they are easy to learn. Deep customer and market understanding however, takes time to develop and once you have it, you are an extraordinarily valuable resource to the company. The keys to unlocking growth are not located inside the offices of your company – they live inside the minds and hearts of your customers. Product Marketers should be the keepers of the maps to those keys. (Q) Are there any parting words of wisdom you would like to leave with our Product Marketing members? An engineer by training, April’s worked as a marketing and sales exec for most of her career. She’s run marketing and sales at a number of startups. In October 2015, April acquired Sprintly – an agile project management tool for startups, along with the original founder, Joe Stump. April works mainly as a consultant to early-stage tech companies. Her specialty is on market positioning and go-to-market strategy. As the differentiating power of traditional sales levers (price, features, brand reputation) wane, the buying experience is growing more important. Product Marketers are responsible for providing buyer insight, often in the form of personas, that help Sales sell. Yet, according to our research at Quarry, the customer segmentation model employed at 70% of B2B enterprises is not meaningfully different from that of competitors. And that poses a problem. These category-driven theories, we must presume, have some basis in fact. But they also suffer from two liabilities that you would be wise to consider. First, as noted above, for 70% of B2B marketers these theories are not proprietary. If the segmentation perspective – meant to be the “difference that makes a difference” – embedded in your personas is the same as the segmentation perspective of your competitor, then, even if you have done an excellent job in every other respect with your personas, the utility that Sales can extract from personas for the purpose of differentiating the buyer’s experience has been limited from the outset. Letting this situation persist hinders an experience-led sales and marketing strategy where customer insight is the edge in creating experiences that connect differently and better. Secondly, even where they may be differentiating, these categorical segmentation perspectives are proving to be weak theories. They rest on assumptions that are crumbling under the weight of evidence and changing circumstances. Let’s take the commonplace (some might even say “best practice”) of using organizational titles as the foundational categorization scheme for personas. Moreover, these top-down categorizations of customers (role, size, vertical) rest on a body of 18th century rationalistic economic and psychological theory that assumes human beings behave in the marketplace as “rational actors.” The last few decades of research in behavioral economics, prospect theory, neuroscience, organizational behavior and cognitive linguistics converge in a way that is extremely harsh to that “rational actor” notion. Now, chances are, you have a somewhat change-averse colleague. Let’s call him Larry. Larry will argue, “well, maybe our segmentation model is the same as our competitor’s for a good reason; maybe that is just what reality looks like.” For Larry, the fact that your segmentation model is the same as a competitor actually feels reassuring – an independent source of validation. And Larry might also assert that while job titles are a weak predictor of “mobilization,” they still seem indispensable to operationalizing B2B demand-gen tactics. What might that process look like? It starts with setting in brackets the current categorical assumptions about the differences between customers that make a difference. It involves a curiosity-driven exploration of your customer’s broader context – not just what your customer thinks about your brand or your category of products. It involves a recognition that the complexity in people’s motivations and the contradictions discovered in their self-stories are not noise to be discarded but instead are foundational assets for building proprietary customer insights. And it involves a certain amount of change management leadership to get your colleagues aligned around an insight-rich view of the customer that is proprietary and custom-tailored to creating differentiating experiences for your customers – both in digital demand-generation channels and in face-to-face selling. If you’d like to learn more about that, you can read about it here. It’s not necessarily easy. Partly because some reassuringly familiar things must be abandoned. Simple categories and tidy, “rational actor” assumptions about b2b purchase decisions need to give way to a more nuanced multi-dimensional viewpoint on buyer’s motivations. And, (something that may make Larry nervous) you’ll have fewer “best practice” examples you can point to for reference until you actually get there. But what are your options? Buyer experience is increasingly driving sales. If you take seriously your responsibility to provide Sales with buyer insight, it’s hard to ignore the evidence that segmentation, as it is widely practiced, undermines experience-based differentiation. There is more that Product Marketers can be doing to help Sales create experiences that really connect. It’s called “experiential segmentation.” And it will separate you from your competitors. Here’s the situation – you have money left in your budget, and you’ve got major content gaps according to the buying cycle. How do you prioritize your spend? If your answer is based more on gut instinct than actual knowledge of your content inventory and gaps, then a content audit could be extremely beneficial to you. According to a Sirius Decisions B2B Content Study, 60-70% of B2B content goes unused. This means that 7 out of the 10 content pieces that you’re slaving over right now are never seen by the outside world. This means that you’re likely misusing your content budget. To prevent this from happening you need to produce content that serves a purpose. You don’t need to reinvent the wheel – start with the content you have. Perform an objective audit across multiple dimensions, including place in customer journey, metrics, format, purpose, etc. The audit will give you a quantifiable result that you can share with your team instead of sitting around the table arguing which pieces should get done. Who’s involved in the buyer journey? What are the triggers that have them initiating their search and at each subsequent stage? Where channels and influencers will they use to find content? Once you have a strong handle on this, determining the content you need to have at each stage of the buying journey becomes much easier. You’re striving to provide helpful content that educates and provides answers to their questions. After you’re done with the audit, don’t be surprised or offended if you realize that much of your existing content should be shown the door. We’ve conducted audits for several clients and found that anywhere between 30-50% of the content they give us to evaluate either needs a face-lift, needs reconstructive surgery or simply needs to go. We also find that most marketers tend to have a lot of late stage content (sell sheets, product briefs, case studies) but are often missing the helpful content found in the beginner and middle stages. While the process of conducting a content audit can be as painful as passing a kidney stone, the inevitable relief in sensational. You’ll have a better understanding of what pieces you have that are actually worth sharing with prospects or customers, and you’ll know what purpose each piece serves. You’ll also know which pieces just need a minor update, which need a major overhaul and which pieces should never see the light of day again. You’ll be a much better position to leverage it for the variety of demand gen, lead nurturing and/or sales enablement programs you’re on the hook for. Most importantly, you and your stakeholders will be much more confident on how your content budget should be spent. David will be reviewing the Content Audit Template that the GET LIFT Agency team uses with their clients at the Product Marketing Community Conference on April 22nd. If you’d like a sneak peak, please reach out to David. (Q) What do you believe are the primary responsibilities for a Product Marketer (PM)? (Q) How can Product Marketers directly influence revenue growth, customer retention and awareness? (Q) What role does a Product Marketer play towards helping an organization become market-driven? (Q) What challenges do Product Marketers face both within their organizations and externally as they look to help their companies become market-driven? (Q) What metrics should a Product Marketer use to measure success? The biggest reason: Our budget and internal marketing resources are stretched thin across an increasing number of channels, including digital and social media. We’re under greater pressure to achieve the ideal mix of spending among those channels—and to prove our worth as marketers. In fact, 58 percent of chief marketing officers said they felt increasing pressure to prove the value of marketing and business communications to their CEO, according to the 2015 CMO Survey. Meeting those demands requires taking a hard look at every aspect of our marketing budget, time and talent to ensure we’re using them as efficiently and effectively as possible. It’s a combination of reducing unnecessary spending we’ve taken for granted in the past and digging deeper to uncover insights that increase revenues. Obviously, there’s no single formula that works for every industry and business model, but there are best practices. As the Head of Marketing for a company that has built its business model on streamlining processes for some of the world’s most profitable organizations and a company that is in the midst of its own transformation, I can tell you what has worked for our clients and for us. The strength of most marketing automation platforms (MAP) is that they can be used in as many creative ways as you can come up. While MAP isn’t typically thought of as a tool for product marketing, there are some really great ways to use your platform to help your product marketing team be more successful. A list of leads and/or contacts with similar product interests can be very helpful for product marketing and these segments can be created using data from a variety of sources. For instance you could have your sales team tag product interest directly in CRM when they speak with prospects or you could use visits to product pages on your website or you could create a list based on product specific content requested. You can even use a combination of these sources to find the products your contacts are honing in on. Most enterprise marketing automation platforms can connect your contact database to your website content and allow you to dynamically offer different content action based on who they are and their past history. Practically this means your website can personalize each interaction by recommending specific content and products based on past interactions. You can create recommendations for other relevant content and even modify your call-to-actions to match any given contact’s product interest. As leads progress through the sales process and seek out more product-focused content, lead nurturing campaigns are a highly efficient and easily measured tactic. You can use them to focus on your prospects’ pain points and how your product can address them as well as the key features and benefits that help. You can also encourage interaction with other MoFU (middle of the funnel) content assets like testimonials, case studies and data sheets. These kinds of campaigns can also help you identify the most active leads and accelerate those to sales. Alerting sales when a lead is ready for some human interaction is a very common practice. What isn’t as common is including product information to help provide context for that follow up. An excellent best practice is to include which product pages the lead has viewed, how many times they have viewed each page and a list of associated content they’ve downloaded or read. The social-sphere is full of conversations and you should know when they are talking about your products. If your MAP has social listening functionality, you should set up campaigns to listen for mentions of your products just like you do for your brand name. You want to know if the market is happy or indifferent and you want to know why. Listening to social media can help you develop important insights you can use in future campaigns. These 5 ideas for product marketing with MAP will depend on the feature set of your platform but even if you can only execute one or two – you will see some powerful results. About the Author: Chris Hokansson is the managing director of One Red Bird. One Red Bird helps B2B marketers use software and data to craft better marketing. Photo by Ell Brown. Available under the Creative Commons Attribution 2.0 License. B2B buying has changed, and this changes the type of work that B2B product marketers should be doing. Trade between companies in anything from a corporate order of photocopiers to a consulting engagement for a struggling business unit has changed dramatically in the past decade. Employees must collaborate and cooperate more than they ever have to get their jobs done, and almost any B2B purchase now requires integrating with a company’s technology and IT systems. This means that a lot of purchases that once required a single “yes” from a senior decision maker who paid for it out of his or her own budget, now need to be discussed by a whole array of people. This often includes someone from IT to ensure the product integrates with existing systems, someone from an information security or data privacy team to make sure there’s no reputation-destroying data leaks, two or three senior managers with responsibility for whatever it is the B2B purchase will help with (you can imagine a product manager, a country manager, and a marketing manager all being involved for example), maybe someone from HR if employees need to be trained on the product, and so on. The average number of decision-makers now involved in making a purchase decision for a B2B product or service is 5.4, and that number is growing. As this post explains, these consensus purchase dynamics stall deals, often before they even get to a stage where customers engage with any marketing collateral, much less a sales rep. Worse, the growing number and diversity of stakeholders involved in purchases means they are less and less likely to find consensus early enough in the purchase process to give suppliers the chance to get a pitch in (research shows that the optimal point for suppliers to influence a purchase decision is 37% of the way through the process). There is a lot that marketing and sales teams can do to respond to these problems; the rest of this post looks at what product marketers can and should be doing, and future posts will look at other marketing roles (see this marketing role guide for more). And in response, product marketers feverishly set about making the value proposition simpler and – “crisper” – than it already was. It might sound like the right thing to do but, based on thousands of data points and years of CEB research, product marketers actually spend too much time on their value propositions. A commercial insight teaches the customer something new that changes the way they think about their own business, and leads uniquely back to the supplier. When crafted well, commercial insights help customers value — and so pay for — the incremental performance the supplier provides. Product marketers — with their knowledge of the marketplace, product vantage point and relationships across the marketing and sales organization — are in the best position to orchestrate the creation of commercial insight. And it really is orchestration — it takes a mix of characters from the product team, Sales, Marketing and sometimes other parts of the firm. But if product marketers don’t take the lead here, no one else will. At least, not as effectively as a product marketer could. Beyond this, product marketers need to rethink the way they gather information on customers and how they get an understanding of what customers are struggling with, and how they go about creating marketing collateral that will help guide potential purchasers through their increasingly difficult decision-making (there’s more in this post and in the Challenger Role Guide for Product Marketers).